So why did I sign up for a 5k? Well.. my boyfriend’s sister, Krystina and he new husband Josh, thought it would be a blast and the tickets were on sale, so hey why not? We bought our tickets on Black Friday, online and they were only $30/person when you signed up as a team. Note: there were no refunds/exchanges of any kind. 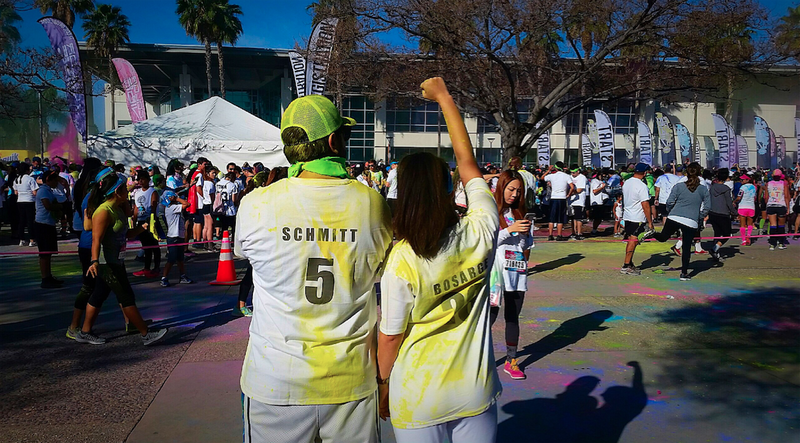 We signed up through the company Color Vibe. I would say that the sign up process was a bit confusing to get us all on one team, but otherwise most everything was clear. The purchase of your ticket was only for that, your admission to the run and for one package of colored chalk; shirts, bibs, etc. were all at an additional cost. Because we bought our tickets so cheap, I didn’t mind that not much was included, but it would have been nice to get a little more for our money. So since we were going to be sprayed with color, of course we went with all white attire. My boyfriend, Daniel, and I made a quick trip to Walmart and picked up what we needed. We all wore these White V-Neck Shirts. They’re super cheap and comfortable. The Color Vibe website notes that the colors are not permanent, but may stain. My guess is it was to cover their butts in case it did stain some materials, but for our purposes, some cheap clothing seemed like the best way to go. I also picked up a pair of these White Leggings so the entire outfit was bright and white! 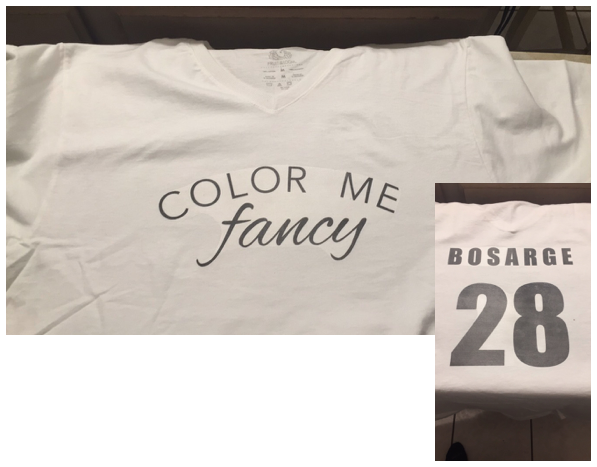 When we signed up, Josh came up with our awesome team name: Color Me Fancy, so of course we wanted to sport it at the run. I bought some of this Fabric Transfer Paper. It was incredibly easy to use and quick for all four shirts! I included our team name on the front and last name and favorite number on the back. For as incredibly out of shape as I am, the run was an absolute blast and I did not feel out of place! There were people of all ages and body types participating and the fact that this race is not a competitively timed one, made for a fun event. The track was 5k in length, through the campus of Cal State Fullerton. The weather was fantastic per usual in Orange County and the campus was beautiful. I liked that we were running on relatively flat terrain, but we also had a portion of running through the Fullerton Arboretum and Botanical Garden which was stunning. I really liked that the beginning of the race was staggered to avoid too large of groups running together and also helped the build up at stations. Throughout the track there were fun and color stations. Volunteers lined the fun stations with balloons, beach balls and pool noodles to cheer you on and they threw colored chalk at you at the color stations. I thought the stations were perfectly spaced out. When I got tired, it was nice to see another station up ahead and gave me motivation to get there. Each color station had a different color, so the farther along you were, the more colors you had! There was also one water station about half way through the race. I would highly recommend doing this race! I think it was a fun and rewarding experience, even for my out-of-shape body. It was definitely a good start for getting back into shape and for a fun Saturday morning with friends! 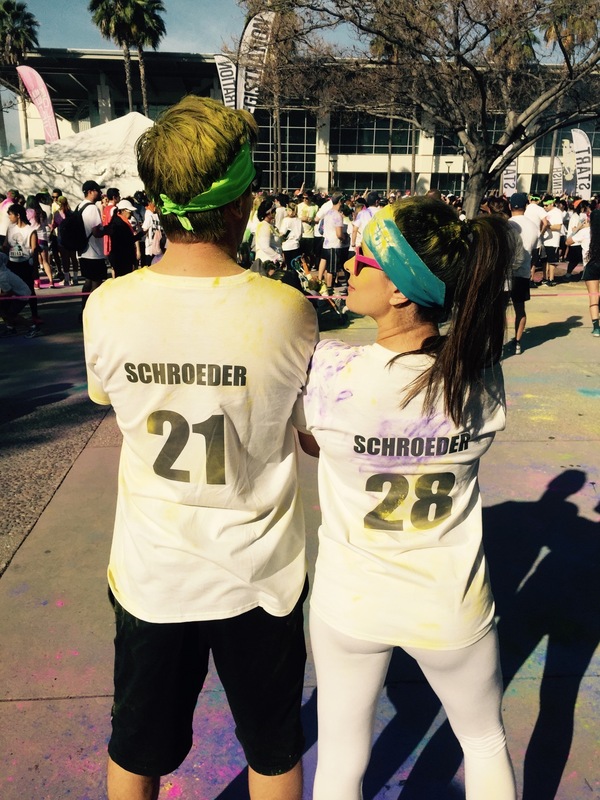 We had so much fun that we signed up for another 5K. We’ll be participating in the Night Nation Run in Orange County on Saturday, April 2nd. I’ll be sure to let you know about my experience there too, stay tuned!